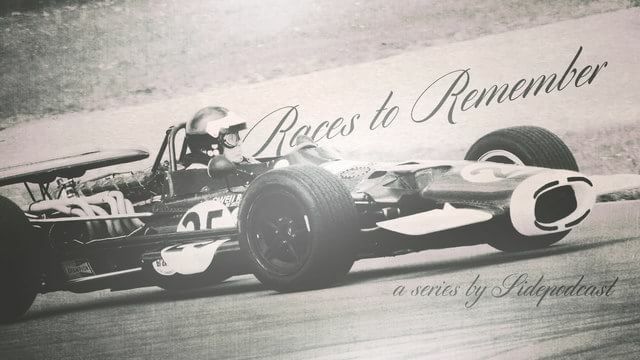 This is Races to Remember, a mini series brought to you by Sidepodcast, taking a look at some of the more memorable entries in the Formula One history books. This series we’re looking at races that have records attached to them, like yesterday’s entry with the fewest number of cars to see the chequered flag. Today, we’re still talking about the finish line, with a supremely close battle. It’s Italy, 1971. The Monza track in the early 1970s was still a fearsome challenge. Although the original banking was no longer used, it was still a high speed circuit peppered with dangers. Drivers arrived at the Italian Grand Prix in 1971 with memories of the death of Jochen Rindt during qualifying the year before, a matter that was still being looked into by the Italian investigators. Several teams were already on the back foot going into the weekend, including McLaren who had one driver away from the track participating in a different series. They ended up fielding just one entry, whilst the Surtees team boosted their number to three. Mike Hailwood made his Formula One comeback with the team that race, having not driven since early 1965. He was quickly on the pace, however, notoriously good at the Monza track, although qualifying saw him down towards the rear of the field. Chris Amon set pole position in the Matra, with Ferrari driver Jacky Ickx second. Behind them, a double BRM second row, with Ronnie Peterson and Jackie Stewart further down the top ten. Stewart had sewn up the driver’s championship at the previous race weekend in Austria, taking the second of his three F1 titles. That left the drivers with three races in hand, in which the pressure was off, and the only thing that mattered was racing and racing hard. Clay Regazzoni started the race eighth, but had a fantastic start that saw him haul his Ferrari up into the lead on the first lap. However, the top running cars were all fiercely competitive, and the high speed nature of the circuit – four straights with top speed corners to barely break momentum – saw the lead changing hands over and over again. World champion Jackie Stewart was involved in the tussle for the top spot but had to retire after less than twenty laps due to an engine failure. Both the Ferrari drivers also dropped out of the race, leaving the returning Hailwood and polesitter Amon to join the fight for the front positions. There was never a moment where the race leader could sit back and relax, confident in his position, and that lasted for the entire race distance. On lap 55, as the cars approached the finish line, the fight was between five separate drivers and no one knew who was going to win. The long straights meant slipstreaming was a common occurrence, and had been throughout the lap, with the winner being decided at the very last split second. In this case, it was Peter Gethin in the BRM, taking his first and only F1 victory. He finished one hundredth of a second ahead of second place Ronnie Peterson in the March. Behind them, François Cevert was a further eight hundredths back, Hailwood another nine, and then the other BRM of Howden Ganley a further four tenths of a second. Amon picked up the final points position of sixth, but was a huge 30 seconds further down the road. The top five drivers, then, were separated by 0.61 seconds in what was an incredibly close and unpredictable finish. Now, there’s some consternation about whether this truly is the closest winning margin, as the timekeepers in those days didn’t keep track to the third decimal place. The US Grand Prix of 2002 was won by 0.11 seconds, so that could be a contender for this record. However, third place in the US was a further eight seconds down the road, so no one can complain that this was the closest top three finish, and top four, and top five. The race also held the record for the fastest race of all time, due to average speeds, but that was broken by another at Monza in the new millennium. The 1971 race was the last to be held on the truly high speed track, with the following year’s Grand Prix layout featuring a couple of chicanes to try and tame the terrifying speeds. That’s all for this mini series episode, thank you for listening. It seems unlikely we’d get a battle that close in the current era of F1, if only because it has been one dominant car after another taking victory. Perhaps one day we’ll see an event to challenge this record, but until then, let’s turn our focus to another! Join me again tomorrow when we look at another Race to Remember.